"volume" bakers, we would cut the recipe in half.... for handling this bread that was a good call... made two nice loaves... as far as taste goes...we could have had much more of this. We got to spend even more time conversing as this is really about a 3 day bake... started Friday evening and baked on Sunday morning... more sisterly time chatting and texting. 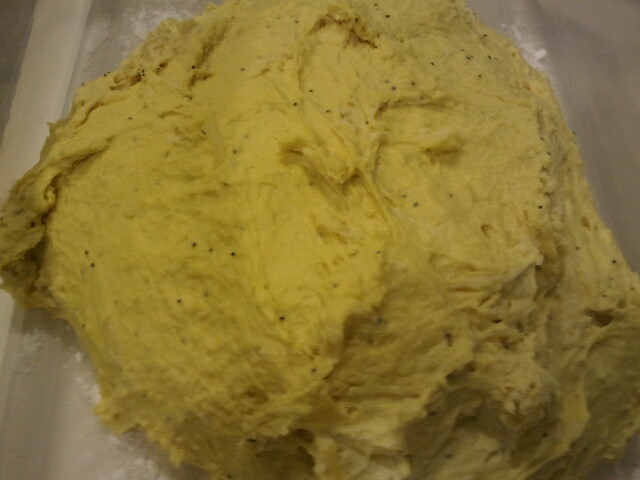 Here is Helen's dough, since at this stage we were all on the same page... I will only do one dough shot... they all looked the same. 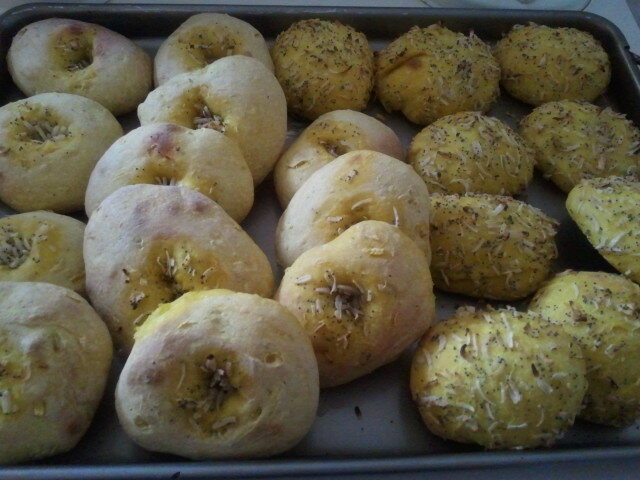 Helen made Onion rolls and Bialys... thanks DA for the suggestion. Those look wonderful. 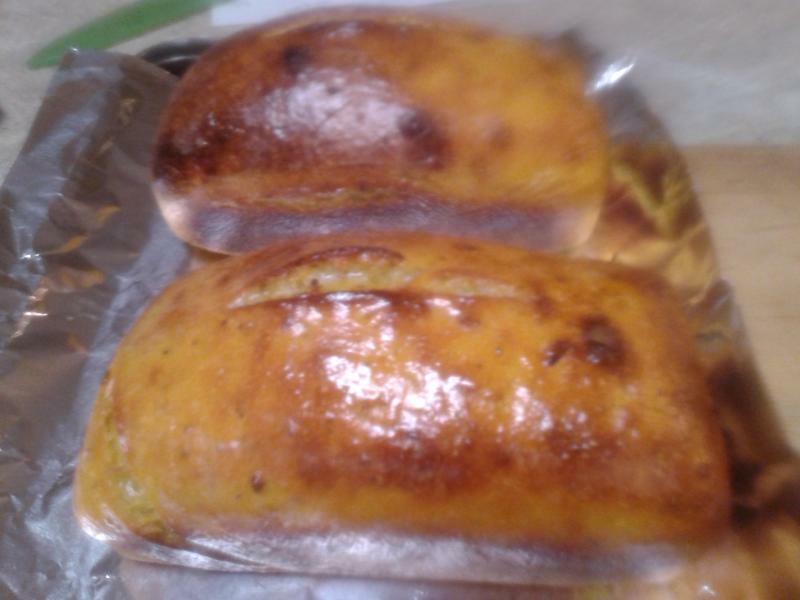 She took them to her daughter's for a Father's day BBQ and they made great hamburger buns. 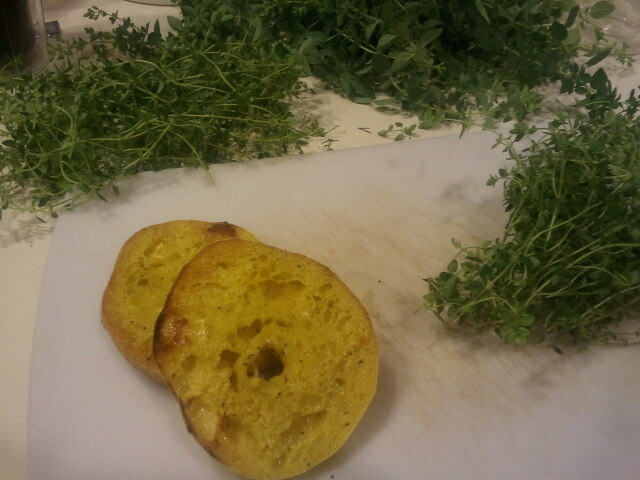 This morning she started gathering herbs to dry, right as it started raining, so she separted the herbs out and decided to have a little "toast and thyme" ... doesn't all that look great and even Healthy! 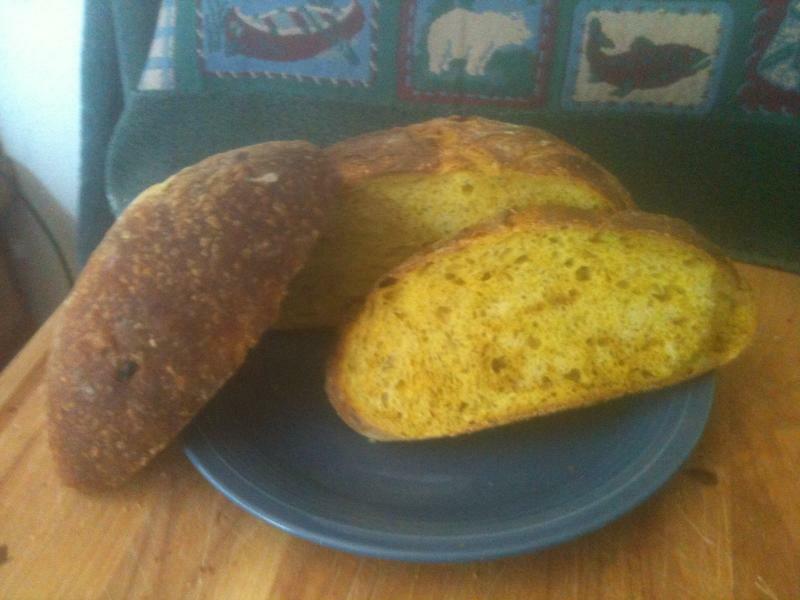 If you have seen our posts before, you know we all take different routes to those great endings... Helen made rolls, I made loaves of this bread so that we could have wonderful savory sandwiches, and Barb made a beautiful big round boldly baked loaf. Below are my sandwich loaves. One of the amazing things we all thought of when making the dough was that it smelled like "stuffing" and looked like a big bowl of deviled egg filling. This is really a very tasty moist bread and holds up well in a sandwich. The picture above is just after she took the lid off the pan. And below is the loaf cooling. 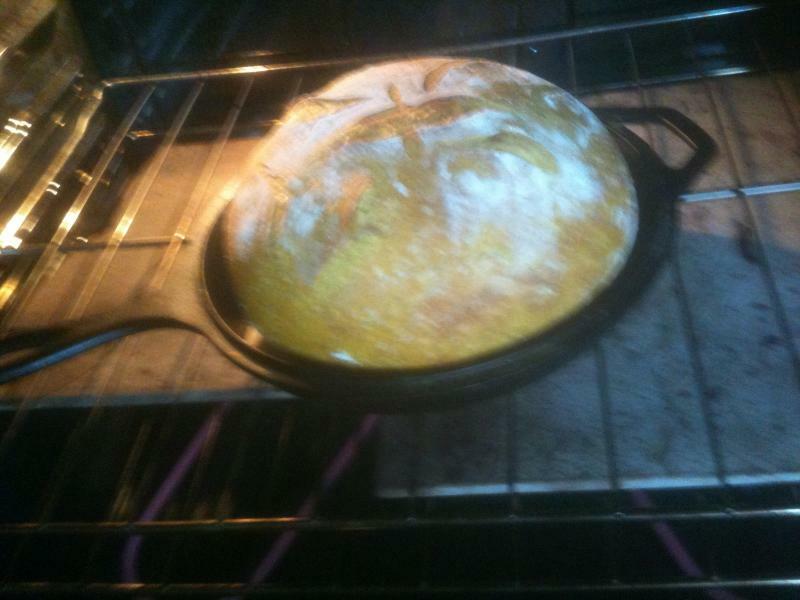 Notice the great crust and those coveted blisters. 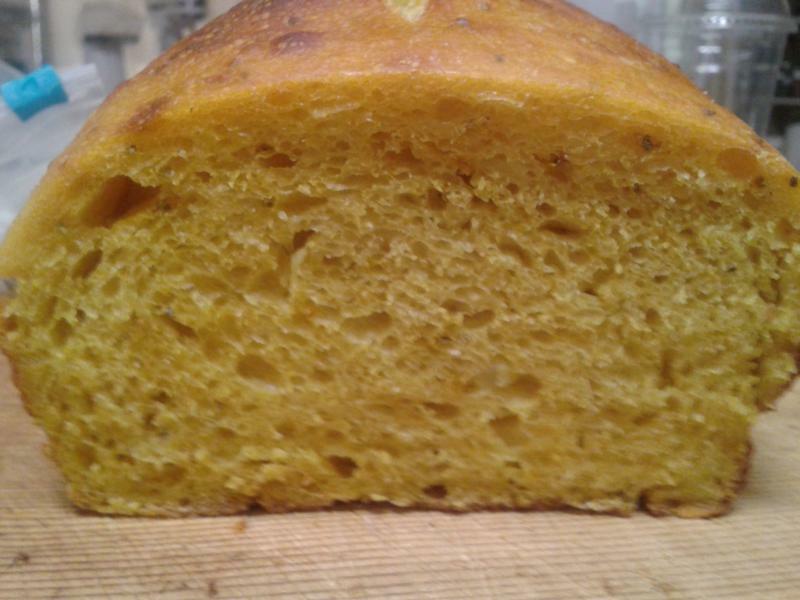 Our crumbs all have that great yellow from the tumeric... makes your brain think "cornbread", and then you get the surprise of Onion bread... lovely. 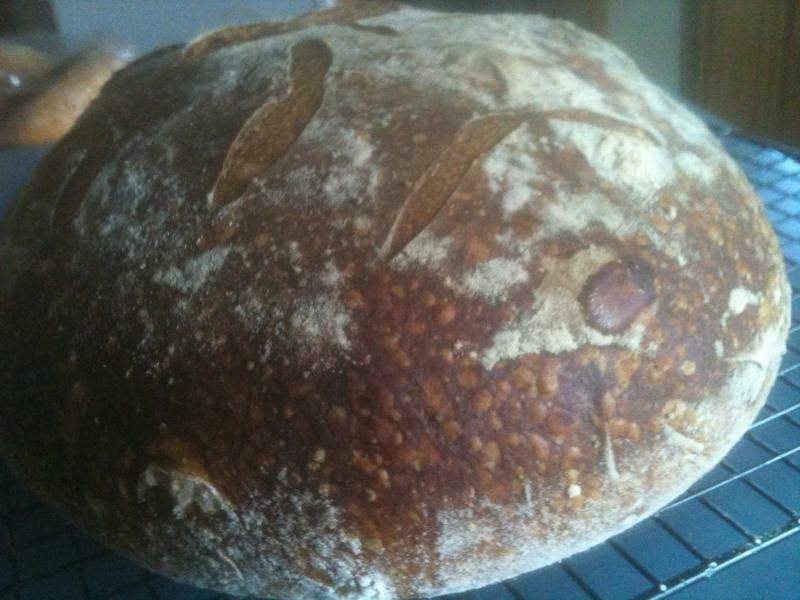 This was a great bake. We are all adding this recipe to our favorites and will be making it again and again. 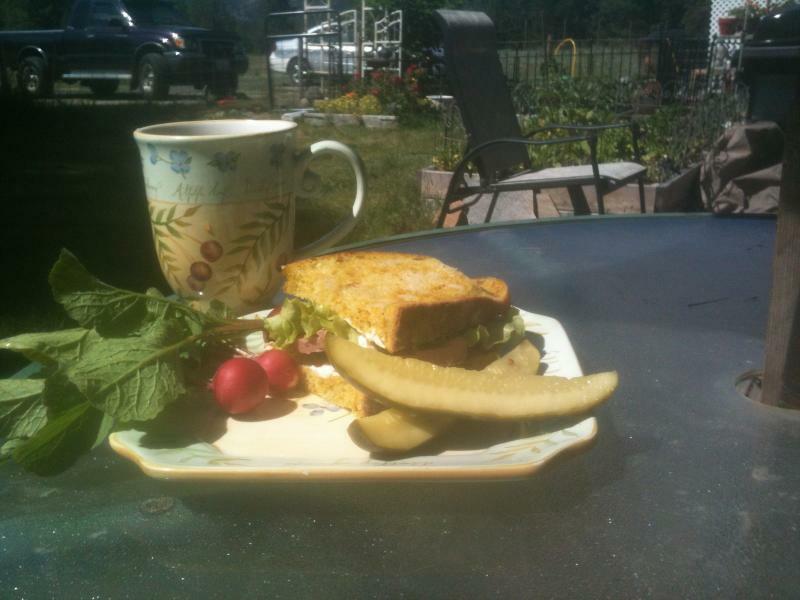 Now let's retire to the porch and have a cup of tea with our savory toast. Looking forward to seeing what Barb picks for us to make next week, it is her turn to choose! Thank for the great write up. I always enjoy reading what you are all up to. 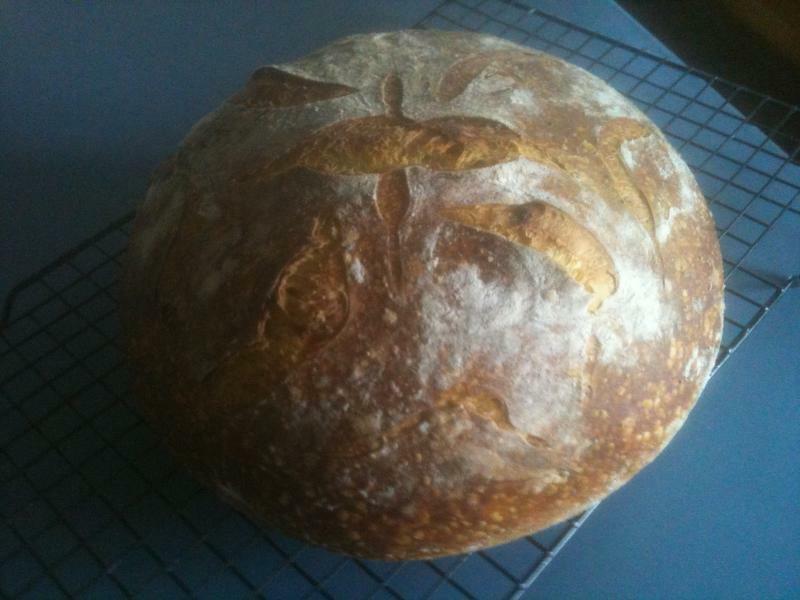 Nice that you share the love of bread and get to bake 'together'. I look forward to seeing what Barb picks out too. for the next picnic! Nice work Ladies! I have to ditto Janet's comment. Always fun to see what rises out of your kitchens. I'm very happy to have inpired you, as I was inspried my Dabrownmans, Shiao-ping and others. Looks like a wonder baking experience! I will have to try it in sandwich form maybe with a tangzhong. sandwiches almost rivaled the Tartine grilled cheese with the added flavor in place of the Tartine texture. Will have to try combining those or similar flavors with that type of bread.